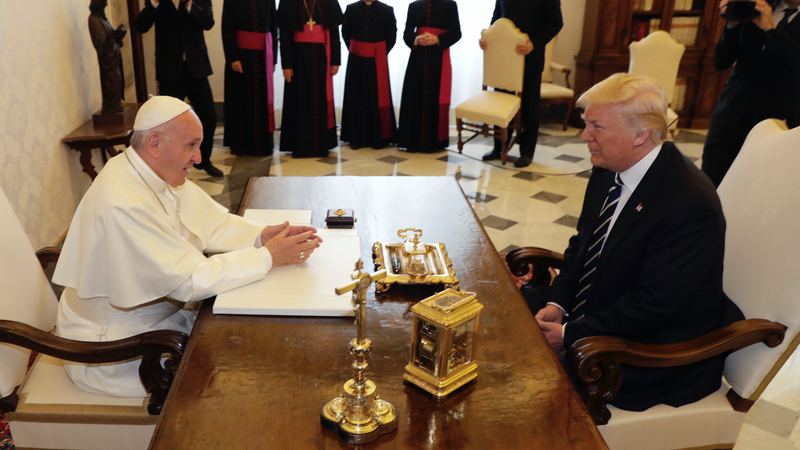 As part of his international, interfaith tour that began in Saudi Arabia, President Trump met with Pope Francis Wednesday at the Vatican to discuss peace, religion, and surprisingly, climate change. As is custom for presidents, Trump and Pope Francis exchanged gifts. Trump gave the pope a first-edition series of literature from Martin Luther King, while the Pope gave the president his 2017 essay on peacemaking and his 192-page encyclical on the importance of combatting climate change. One of the key takeaways from Pope Francis’ encyclical is the need for a global approach to combatting climate change. Trump’s track record here is equally dismal, as he promised followers on the campaign trail he would withdraw the US from the Paris Agreement, a coalition between 147 nations to dramatically reduce carbon emissions. While Pruitt wants to withdraw from the agreement and Trump has previously promised to ‘cancel’ it, the president has delayed any official decision on the matter until after the G7 international summit, which begins later this week. The Paris Agreements’ ultimate goal is to keep the global temperature rise below 2 degrees. The US will likely fail its individual carbon emission goal, with experts pointing the finger squarely at Trump’s rapid repeal of environmental regulations. That itself is a serious blow to the international agreement, because the US is second largest emitter of carbon. Trump’s initial hostility towards environmental protection has perhaps softened to a type of ignorant disinterest as the White House is continually swallowed up in scandals, but will His Holiness change Trumps’ mind? At this point, it would take a miracle.